SE Campus’ Judith Carrier Library isn’t spying on students with its surveillance system, but it is capable of seeing what’s happening in and around its bookshelves. Two years ago, the library noticed 35 to 40 books disappeared in a two-month span. The books in question were all very similar. She said the ring of thieves in question was stealing expensive science textbooks to sell online. One of the ways the library combatted this was by making textbooks available only to TCC students. “Instead of replacing them with physical copies, we replaced them as electronic books,” she said. In her 11-year career at the SE library, Klemm said she’s never seen a student attempt to steal a book. The staff have ways of tracking whether a book was stolen or not. Frequently, library staff districtwide go through all the shelves and cross-check what’s listed as being available with what’s physically on the shelf. “That’s an ongoing process to prevent theft and to make sure the catalog reflects what’s on the shelves — what we need to purchase or replace,” she said. A camera surveillance system also combats theft although the library staff doesn’t have full access to the footage from cameras. 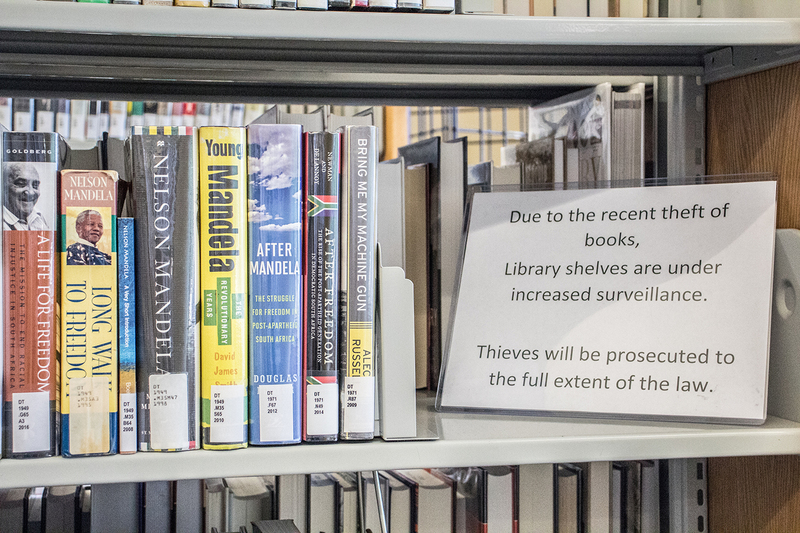 She said the cameras were put in place to monitor more than the bookshelves for theft. “The cameras we have are not only to protect the books, but also to protect students,” Klemm said.